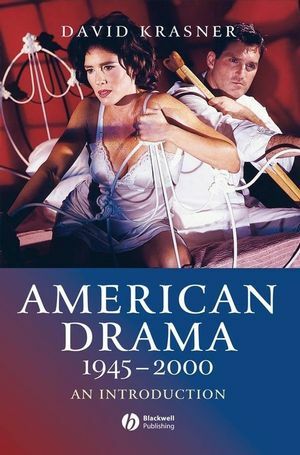 This concise introduction to American drama gives readers an overview of how American drama developed from the end of the Second World War to the turn of the twenty-first century. Provides a balanced assessment of the major plays and playwrights of the period. Shows how these dramatists broke new ground in their contribution to political, economic, social and cultural debates, as well as in their dramaturgical strategies. Organized chronologically, with plays, playwrights and movements clustered around different movements such as realism and experimentalism. Gives readers a sense of the development of American drama over time. David Krasner teaches theatre, drama, and performance at Yale University. He is the author of Resistance, Parody and Double Consciousness in African American Theatre 1895-1910 (1997), and A Beautiful Pageant: African American Theatre, Drama and Performance in the Harlem Renaissance (2002). He is also the editor of A Companion to Twentieth-century American Drama (Blackwell, 2004), co-editor of Staging Philosophy: New Approaches to Theatre and Drama (2006), and co-editor (with Rebecca Schneider) of the University of Michigan Press’s series Theatre: Theory/Text/Performance. 1 Politics, Existentialism, and American Drama, 1935–1945. 2 Money Is Life: American Drama, 1945–1959. 3 Reality and Illusion: American Drama, 1960–1975. 4 Mad as Hell: American Drama, 1976–1989. 5 The Body in Pain: American Drama, 1990–2000. A concise introduction to American drama from the end of the Second World War to the turn of the twenty-first century. Provides a balanced assessment of the major plays and playwrights of the period, among them Arthur Miller, Eugene O'Neill and Tennessee Williams.